I feel like fried pickles have been haunting me. Everywhere we went seemed to have fried pickles on the menu. I wanted those fried pickles. And everywhere I was met with the dreaded words: “Sorry, we’re out”, “we just changed our menu and took those off”... etc. You know how if you can’t get something, you just want it more. And then you build it up in your head so that when you finally get it, it’s not as good as you thought it would be? That did not happen here. 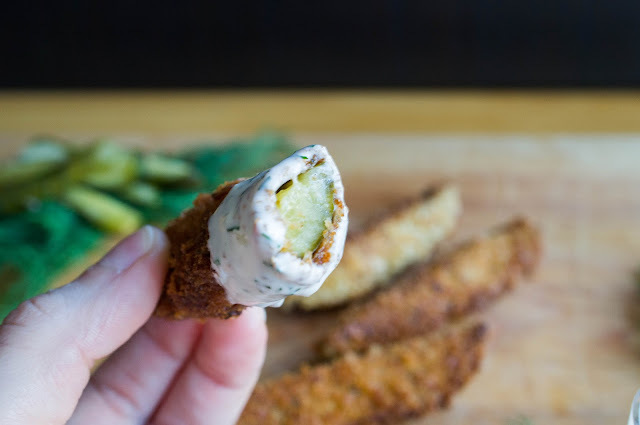 When I finally decided to make fried pickles myself, they were everything I hoped they would be. 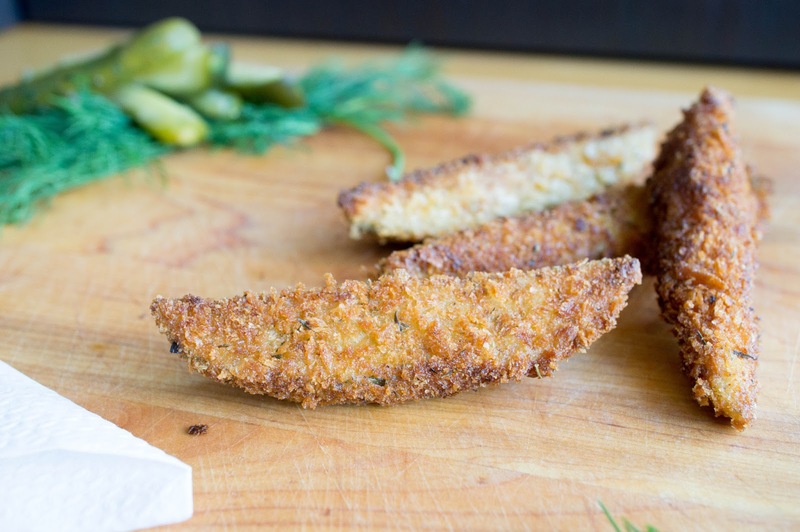 Crispy breaded outside, dilly, juicy inside. With a dunk of homemade ranch dressing. Perfection. These are so snackable and because I’m lazy, I didn’t even deep fry them. I shallow fried them. So easy. In fact, I am absolutely certain that anything breaded and fried in this way would be delicious. Next stop: breaded and fried cheese. You can’t stop me. Cut your pickles into quarters lengthwise so that you get 4 wedges per pickle. Pour flour onto one plate. Pour buttermilk into a shallow dish. Mix together bread crumbs and spices in another dish. Set up your assembly line: flour, buttermilk, bread crumbs. 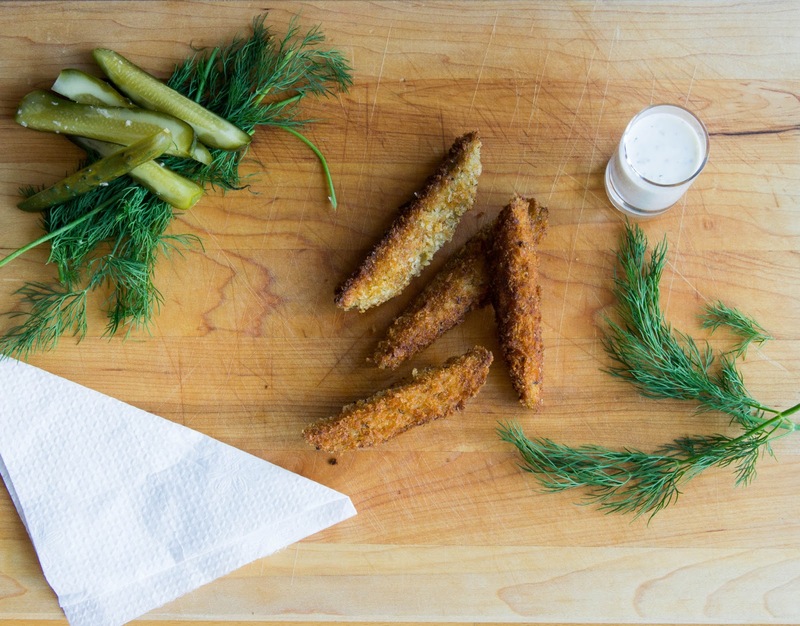 Dry your pickles wedges by patting with a paper towel. Then dip into buttermilk, then into flour until coated. 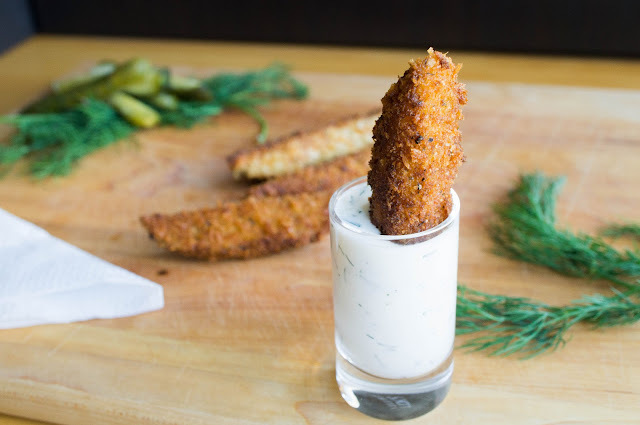 Dip into buttermilk again, then into bread crumbs. Pat bread crumbs around pickle so that it has a nice thick coating. Set aside on a plate, ready for frying. Heat about 1/2 inch of oil in a heavy skillet over medium heat until a small drop of water fizzes and bounces when dropped in. Lay pickles in hot oil carefully, not crowding the pan (I fit about 8 wedges in each batch). Fry on one side until golden brown (about 1-2 minutes). Flip over and fry other side for about 1 minute, or until golden brown again. The round edge (that used to be the outside of the pickle) should brown just from being half submerged in the oil each time, so don’t worry about flipping a second time. 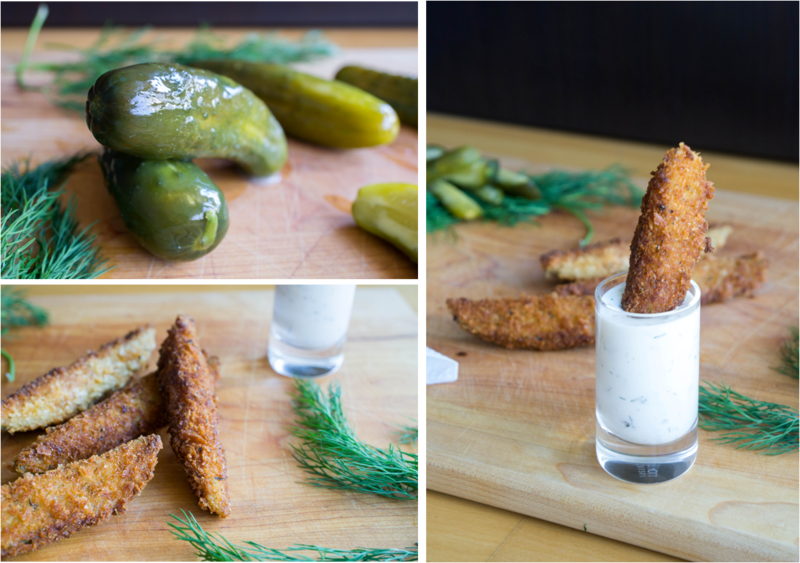 Place fried pickles on a paper towel lined plate to cool. Eat with some homemade ranch dressing. I recommend this recipe from the Pioneer Woman.